What math problems did Babylonian kids do? This is a real math problem assigned to Babylonian kids in Iraq about 1900 BC. See if you can do it. Suppose you have two equilateral triangles, one inside the other. Can you figure out the area of the space between the two triangles? Probably the teacher wanted you to find the area of both equilateral triangles (you need square roots!) and then subtract the smaller one from the bigger one. Probably to get the square roots without a calculator, the students looked at a table of square roots, like a multiplication table. Cite this page: Carr, K.E. 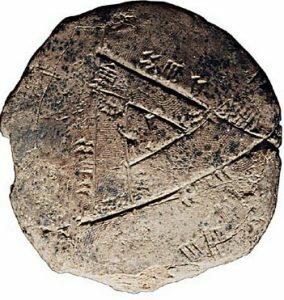 Babylonian math problem – West Asian science. Quatr.us Study Guides, September 16, 2017. Web. April 17, 2019. Well, I’ve been looking into it, but I think the truth is it’s more complicated than I made it sound. There’s no simple answer to this math problem. Most likely, the Babylonian answer relied on memorizing tables, like multiplication tables. I’m realizing I need to rewrite the article and admit that even so long ago, students did math problems that were pretty hard!